Sixteen years ago, when the winter sporting world assembled in Salt Lake City for the 2002 Olympic Games, there was little Daniel Brickley and his older sister Abbie performing in the opening and closing ceremonies. 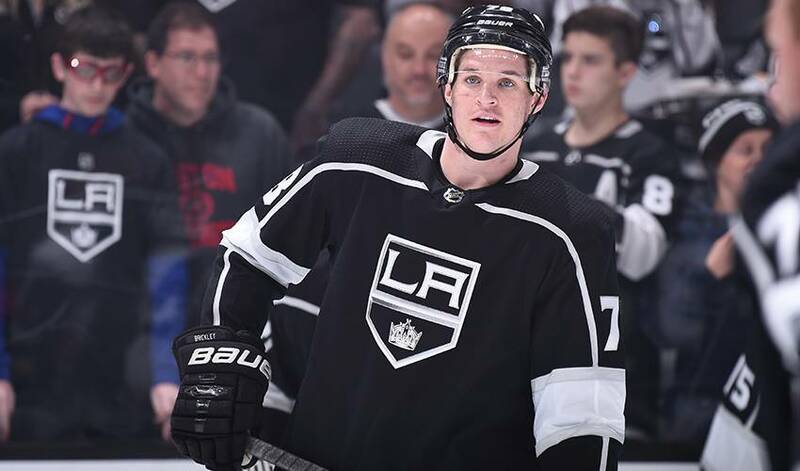 Daniel, now 23 and a defenceman with the Los Angeles Kings, was a few weeks shy of his seventh birthday but he remembers it fondly and being among the world’s best set the stage for his career in hockey. It was indeed a big stage. There were billions watching on television around the world as 2,300 athletes from 78 countries followed the Children of Light into the packed 50,000-seat Olympic Stadium. Brickley and his sister were part of the ice-skating, lantern-toting youngsters known as the Children of Light. The slogan for the Salt Lake 2002 was Light the Fire Within. This experience may have predetermined young Daniel and Abbie’s path to becoming accomplished athletes. But even if the 2002 Winter Games weren’t in Salt Lake City, they likely would have found their way in the sporting world. Daniel’s father, Matt, came from an athletic family in Melrose, Mass. His four brothers were athletes as were his two sisters. Daniel’s grandmother, Bertha, is a massive Boston Red Sox fan. Matt was a longtime minor-league and college referee. His brothers George and Quinton played minor-league hockey and Andy played for the Boston Bruins and finished his career in the IHL with the Utah Grizzlies in Salt Lake City. Andy currently is a popular game analyst on Bruins broadcasts. John was a baseball player and major league scout for 13 years. Matt’s sisters, Lila and Raina, played softball and golf, respectively. Abbie played basketball for four years at Wheaton College in Norton, Mass. In Daniel’s case, the state of Utah is not known for churning out hockey talent. Brickley and Kings forward Trevor Lewis currently are the only two from the bee state. That dream was realized last April. Brickley wasn’t drafted, but after three years at Minnesota State and a stint with the United States national team at the 2017 World championship in Germany and France, he became a sought-after prospect. There were several teams lining up to sign him as a free agent. He narrowed down the pursuers to the Detroit Red Wings, San Jose Sharks and the Kings. He called the experience hectic, but fun. The Kings won because they seemed like the right fit. It didn’t hurt that one of Brickley’s favourites is Los Angeles defenceman Drew Doughty. Brickley was signed last March and he saw action in their second-last regular season game, a 5-4 overtime win against the Minnesota Wild, in which he assisted on Tobias Rieder’s second-period goal. It was quite an evening for the Brickleys. Matt has been battling stage 4 colon cancer, but he was there in the Kings suite with wife Ally, Abbie and Daniel’s brother Sam taking in Daniel’s debut. The family celebrated afterwards with an on-ice photo.